Heat oven to 350°F (325°F for dark or nonstick pan). Grease and lightly flour bottoms and sides of two 8- or 9-inch round pans. In small bowl, toss 2/3 cup chocolate chips with 1 tablespoon cake mix. In large bowl, beat remaining cake mix, water, butter and eggs with electric mixer on low speed 30 seconds, then on medium speed 2 minutes, scraping bowl occasionally. Stir in coated chocolate chips; pour into pans. Bake as directed on box for 8- or 9-inch rounds. Cool 10 minutes. Run knife around side of pans to loosen cakes; remove from pans to cooling rack. Cool completely, about 1 hour. Refrigerate layers 45 minutes for easier handling. In chilled large bowl, beat whipping cream and icing sugar with electric mixer on high speed until soft peaks form. In medium bowl, gently stir together 1 cup of the raspberries and the preserves; fold in 1 1/2 cups of the whipped cream. Trim off rounded top of one layer. Slice each cake layer in half horizontally to make a total of 4 layers. Reserve untrimmed top layer. Place 1 layer, cut side up, on serving plate; spread with about 3/4 cup raspberry-cream mixture. Repeat with second and third layers. Top with reserved cake layer, cut side down. Frost side and top of cake with remaining whipped cream. Arrange remaining 1/2 cup raspberries over top of cake. Press 1 1/2 cups chocolate chips into side of cake. Store loosely covered in refrigerator. 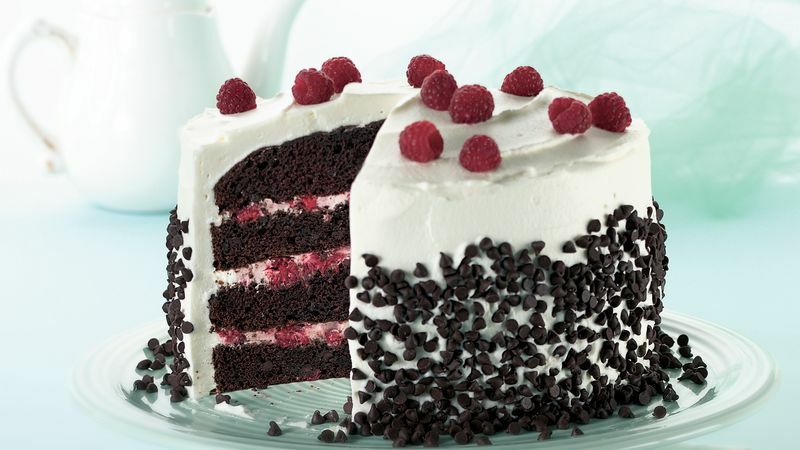 Add the raspberries to the top of this cake just before serving. If you place them on the frosting too soon, some of their colour may “bleed” into the frosting. For a twist, try an almond-flavoured frosting and filling. Simply add 1 teaspoon almond extract to the whipping cream and icing sugar before beating in step 4. Raspberries are delicate little gems. Be sure to look for brightly coloured and plump berries with no signs of mold. You can store raspberries, in a single layer if possible, in the refrigerator up to 3 days. To prevent mushiness, rinse lightly just before using. Use a container of Betty Crocker™ Creamy Deluxe™ vanilla frosting instead of the whipped cream.